STADIUM RETAIL 224 • SHOPPING CENTER BUSINESS • May 2018 beau Field that would be an amenity to the community, a catalyst for regional growth and make the area more of a destination," he says. "We began to look at how people would use the area all year round and how we could make it as place-specific and au- thentic as possible." Unique features of the project include a 300-foot sledding hill and a 15,000-square- foot ice skating rink. About 10 acres of the 34-acre development is dedicated to open space and parks. In the summer months, Titletown will host fitness classes, con- certs and movies. 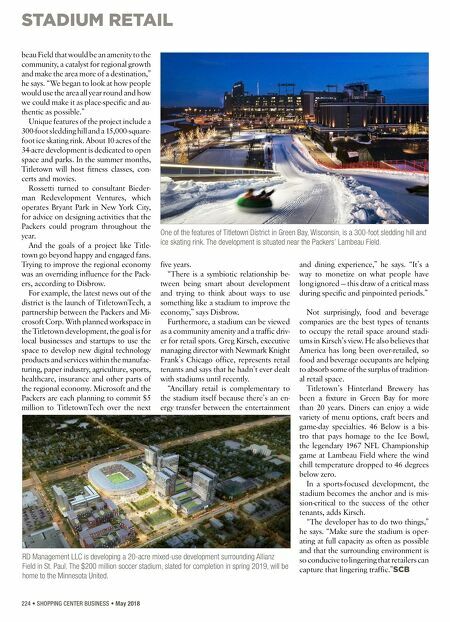 Rossetti turned to consultant Bieder- man Redevelopment Ventures, which operates Bryant Park in New York City, for advice on designing activities that the Packers could program throughout the year. And the goals of a project like Title- town go beyond happy and engaged fans. Trying to improve the regional economy was an overriding influence for the Pack- ers, according to Disbrow. For example, the latest news out of the district is the launch of TitletownTech, a partnership between the Packers and Mi- crosoft Corp. With planned workspace in the Titletown development, the goal is for local businesses and startups to use the space to develop new digital technology products and services within the manufac- turing, paper industry, agriculture, sports, healthcare, insurance and other parts of the regional economy. Microsoft and the Packers are each planning to commit $5 million to TitletownTech over the next five years. "There is a symbiotic relationship be- tween being smart about development and trying to think about ways to use something like a stadium to improve the economy," says Disbrow. Furthermore, a stadium can be viewed as a community amenity and a traffic driv- er for retail spots. 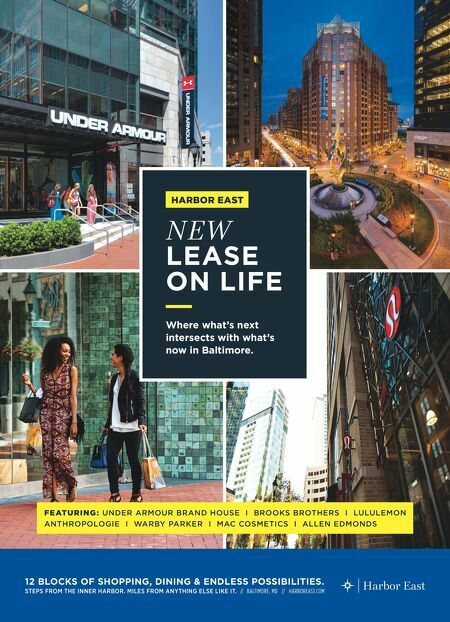 Greg Kirsch, executive managing director with Newmark Knight Frank's Chicago office, represents retail tenants and says that he hadn't ever dealt with stadiums until recently. "Ancillary retail is complementary to the stadium itself because there's an en- ergy transfer between the entertainment and dining experience," he says. "It's a way to monetize on what people have long ignored — this draw of a critical mass during specific and pinpointed periods." Not surprisingly, food and beverage companies are the best types of tenants to occupy the retail space around stadi- ums in Kirsch's view. He also believes that America has long been over-retailed, so food and beverage occupants are helping to absorb some of the surplus of tradition- al retail space. Titletown's Hinterland Brewery has been a fixture in Green Bay for more than 20 years. Diners can enjoy a wide variety of menu options, craft beers and game-day specialties. 46 Below is a bis- tro that pays homage to the Ice Bowl, the legendary 1967 NFL Championship game at Lambeau Field where the wind chill temperature dropped to 46 degrees below zero. In a sports-focused development, the stadium becomes the anchor and is mis- sion-critical to the success of the other tenants, adds Kirsch. "The developer has to do two things," he says. "Make sure the stadium is oper- ating at full capacity as often as possible and that the surrounding environment is so conducive to lingering that retailers can capture that lingering traffic." SCB One of the features of Titletown District in Green Bay, Wisconsin, is a 300-foot sledding hill and ice skating rink. The development is situated near the Packers' Lambeau Field. RD Management LLC is developing a 20-acre mixed-use development surrounding Allianz Field in St. Paul. The $200 million soccer stadium, slated for completion in spring 2019, will be home to the Minnesota United.